In 1810, the chairmanship was granted to the state Chancellor count Nikolay Rumyantsev, the former then Chairman of the State Council. Since 1812, as Chairman of the Committee has evolved into an independent position, which until 1865 necessarily coincide with the presidency of the Council of State. Traditionally, the chairmanship of the Committee was last in the public service honorary position appointed by the dignitaries that have become too old to execution of the duties of the Minister. A number of Committee chairmen (especially duke Alexander Chernyshyov, count Alexey F. Orlov, count Dmitry Bludov) was characterized by contemporaries as "barely alive", "miserable". Count Modest Korf jokingly wrote about count Chernyshov: "Look, just live!" Duke Pavel Gagarin died in office at the age of 83 years. The modern post of Prime Minister appeared in 1905. By the decree of Emperor Nicholas II on the 19 October 1905 was established the government — the Council of Ministers bringing together the Ministers in one Cabinet (previously each Minister reported directly to the Emperor about the Affairs of his Department). The Chairman of the Council of Ministers officially became a full-fledged head of government. 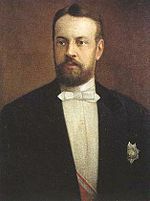 The first Prime Minister was appointed count Sergei Witte. Since 1905, the Prime Minister received extensive powers, had the opportunity to pursue their own policies and reforms. So one of the strongest Prime Ministers is considered Pyotr Stolypin, who during his Premiership has held several major (though controversial) reforms. Despite the presence of the State Duma, the Government was not responsible to Parliament. Although Sergei Witte and Pyotr Stolypin at the beginning of his Premiership, tried to form a coalition government of the largest political organizations, they did not succeed. 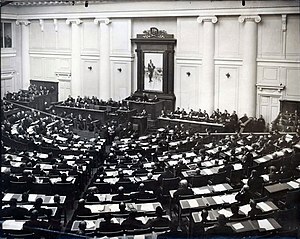 State Duma nevertheless tried to gain influence on the government, particularly the conflict of the state Duma and the government were evident during the Premiership of Ivan Goremykin. The position of Chairman of the Council of Ministers of the Russian Empire, lasted 12 years, during this time, 7 people took this post (one twice). The position was abolished after the Russian revolution, the abdication of Nicholas II from the throne and the formation of the Provisional government. During the Russian Provisional Government in 1917, the official title of the prime minister was "Minister-Chairman of the Russian Provisional Government". This position was held by only two people, Georgy Lvov and Alexander Kerensky. The position lasted about six months, and after the October Revolution, was replaced by Chairman of the Council of People's Commissars of the Russian SFSR. In the era of the Soviet Union, the head of government was the Chairman of the Council of People's Commissars (until 1946) and the Chairman of the Council of Ministers (after 1946). People who held those positions are sometimes referred to as the prime ministers. They may have also been referred to as Premier of Ministers, or simply premier. Currently, the formal title is the Chairman of the Government of the Russian Federation. In modern Russia the Prime Minister is appointed by the President with the consent of the State Duma. The Prime Minister is responsible to the President and regularly reports to him, however to the State Duma he reports only once a year. After the election of Boris Yeltsin, President of Russia, the head of the government was Yeltsin personally. He headed the Russian SFSR Council of Ministers (16 May 1992, the Council of Ministers of the Russian Federation) for about six months. In fact, Yeltsin was the first Head of Government of Russia after the dissolution of the Soviet Union, however he was not the Prime Minister. After Yeltsin, Yegor Gaidar became Acting Prime Minister, but the Russian Supreme Soviet refused to approve him as Prime Minister. On 14 December 1992, the Prime Minister appointed was Viktor Chernomyrdin. The Russian political system is similar to the modern French system. For the appointment of the Prime Minister the President needs a majority in the state Duma. If the party President does not have the majority and fails to form a coalition, the President may need to appoint a loyalist to the position of Prime Minister. For example this occurred in 1998 when the state Duma (which had most of the opposition to the President of the party) twice refused to appoint Prime Minister Viktor Chernomyrdin and Boris Yeltsin appointed Prime Minister Yevgeny Primakov, who supported the left opposition. In the mid-90s in Russia there was a term "Technical Prime Minister". This term refers to the Prime Minister, who is not an independent political figure, is only the nominal head of government, and in fact the activities of the government are headed by the President. determines the operating priorities of the Government and organizes its work in accordance with the Constitution, federal constitutional laws, federal laws and Presidential decrees, aside from running the day-to-day affairs of the government, in general. Initially, the Prime Minister was appointed by the Emperor of Russia, without the consent of the candidate to the State Duma. In Soviet times, Prime Minister of the Russian SFSR was appointed by the Supreme Council after each election. Currently Prime Minister is appointed by the President of Russia, subject to the consent of the State Duma (before 1993 the Supreme Soviet). Unlike most other "Prime Ministers", who are also elected members of the legislative body or parliament, the Chairman of the Government of Russia can be any Russian citizen, as long as they do not also hold citizenship of another country. Under law, the President shall nominate a new Chairman of the Government within two weeks of the resignation of a previous government or inauguration ceremony of President. The State Duma is to discuss the matter within two weeks of the nomination and make a decision. The procedure of granting consent by the parliament is usually preceded by several days of comprehensive consultations and interviews of the candidate by the parliamentary factions. Should the State Duma decide to give the President its approval, the President may immediately sign the respective appointment decree. Should the State Duma refuse to give its approval, the President will have to nominate another (or the same) candidate within one week of the rejection of the previous candidate. Should the State Duma reject candidates nominated by the President for three times consecutively, the President shall dissolve it and call a new election, while the Prime Minister shall be appointed by the President without participation of the Duma. 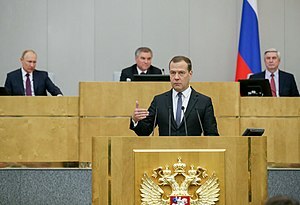 The State Duma may not be dissolved on these grounds during the first year after parliamentary elections, the last six months of the incumbent President's term, as well as in time of emergency, or war and in the event that the State Duma has initiated the impeachment of the incumbent President. Other members of the Russian Government are appointed and dismissed by the President upon recommendation of the Prime Minister. The Prime Minister may be dismissed by the President at any time at the President's discretion. The Prime Minister may also tender his resignation to the President on his own initiative. The President may reject such resignation and oblige him to continue working. The Prime Minister and the whole government are constitutionally obliged to resign after the inauguration of a newly elected President. The resignation of the Prime Minister automatically means the resignation of the whole government as a body. Under certain circumstances, the President may also theoretically be forced to dismiss the Chairman and the whole government under the pressure of the State Duma. For that to happen, the State Duma has to pass a censure motion against the Government twice within three months. Normally, in this case the President has the right to choose whether to sack the government or to dissolve the Duma (and if the Duma passes the censure motion just once, the President may also choose "not to agree" with the decision of the Duma, which technically means that neither the cabinet nor the Duma are dismissed). However, within one year after parliamentary elections the dissolution of the Duma is impossible on these grounds. That is why in this case the President does not have any other option but to dismiss the Government (even if he totally supports it). However, the President is theoretically free to appoint the very same person as an acting head of the cabinet for an indefinite period of time should finding a compromise with the parliament turn out to be impossible. Initially the term of office of the Prime Minister was not formally established. The head of the government served in his post for as long as the Emperor thought necessary. In Soviet times, the term of the Prime Minister was also unlimited. The Chairman Council of Ministers of the Russian SFSR served in the position until he was dismissed by the General Secretary of the Communist Party of the Soviet Union. A term limit was introduced after the creation of the post of the President of Russia. Government became subordinate to the President, so the Prime Minister must resign along with the President, but may be appointed again. From 1991 to 1996, the maximum term of office of the Prime Minister was 5 years. After the new Constitution of Russia was created, the term of office of the President, and therefore the term of office of the Prime Minister, was shortened to 4 years. In 2012, after amendments to the Constitution the term of the President and Prime Minister was increased to 6 years. Russian law does not specify who should become acting Prime Minister in case of his incapacity. Despite the presence of several Vice Prime Ministers, the President appoints the acting Prime Minister, and not always the acting Head of Government is his Deputy. Very often, the acting Prime Minister later proposed the State Duma as the new Prime Minister. In case of the President's death, resignation or impeachment, the Prime Minister becomes a temporary president until new presidential elections which must take place within three months. The Prime Minister as Acting President may not dissolve the State Duma, announce a referendum or propose amendments to the Constitution. The Chairman of the Federation Council is the third important position after the President and the Prime Minister. In the case of incapacity of the President and Prime Minister, the chairman of the upper house of parliament becomes acting head of state. As of April 2019, there are seven living former Prime Ministers. The most recent death of a former Prime Minister was that of Yevgeny Primakov (1998–1999) on 26 June 2015, aged 85. ^ Федеральный конституционный закон «О ПРАВИТЕЛЬСТВЕ РОССИЙСКОЙ ФЕДЕРАЦИИ» Archived 2009-08-17 at the Wayback Machine kremlin.ru 17 декабря 1997. ^ "The Constitution of the Russian Federation: Section One, Chapter 6. – The Government of the Russian Federation". Bucknell University. Retrieved 2014-07-14. ^ "Пост Председателя Совета Федерации РФ – это третий пост в стране. В случае недееспособности президента и премьера именно председатель верхней палаты парламента должен возглавить государство." note: Acting chairmen shown in italics. Questionable Heads of Government are written in small type. The Prime Minister of Lithuania is the head of the Government of Lithuania. The prime minister is Lithuania's head of government and is appointed by the President with the assent of the Lithuanian parliament, the Seimas. The modern office of Prime Minister was established in 1990, during the turmoil surrounding the Soviet Union's collapse, although the official title was "Chairperson of the Council of Ministers" until 25 November 1992. The constitutional crisis of 1993 was a political stand-off between the Russian president Boris Yeltsin and the Russian parliament that was resolved by using military force. The relations between the president and the parliament had been deteriorating for some time. The constitutional crisis reached a tipping point on September 21, 1993, when President Yeltsin aimed to dissolve the country's legislature, although the president did not have the power to dissolve the parliament according to the constitution. Yeltsin used the results of the referendum of April 1993 to justify his actions. In response, the parliament declared that the president's decision was null and void, impeached Yeltsin and proclaimed vice president Aleksandr Rutskoy to be acting president. The Federation Council is the upper house of the Federal Assembly of Russia, according to the 1993 Constitution of the Russian Federation. Each of the 85 federal subjects of Russia – consisting of 22 republics, 46 oblasts, nine krais, three federal cities, four autonomous okrugs, and one autonomous oblast – sends two senators to the Council, for a total membership of 170 Councillors. Our Home – Russia, abbreviated as NDR, was a Russian political party that existed from 1995 to the mid-2000s. 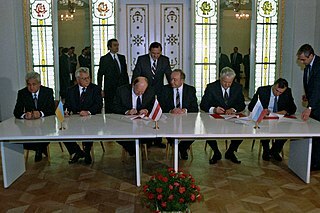 The Belovezha Accords are the agreement that declared the Union of Soviet Socialist Republics as effectively ceasing to exist and established the Commonwealth of Independent States (CIS) in its place as a successor entity. It was signed at the state dacha near Viskuli in Belovezhskaya Pushcha on December 8, 1991, by the leaders of three of the four republics-signatories of the Treaty on the Creation of the USSR – Russian President Boris Yeltsin and First Deputy Prime Minister of RSFSR/Russian Federation Gennady Burbulis, Ukrainian President Leonid Kravchuk and Prime Minister of Ukraine Vitold Fokin, Belarusian Parliament Chairman Stanislav Shushkevich and Prime Minister of Belarus Vyacheslav Kebich. The original accord could not be found as of 2013. 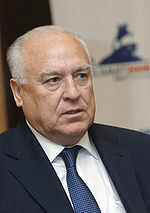 Valery Dmitrievich Zorkin is the first and the current Chairman of the Constitutional Court of the Russian Federation. The Chairman of the State Duma of the Federal Assembly of the Russian Federation, also called Speaker (спикер), is the presiding officer of the lower house of the Russian parliament. His responsibilities include overseeing the day-to-day business of the State Duma presiding and maintaining order at the regular sessions of the parliament. The Speaker also chairs the Council of the Duma which includes representatives from all the parliamentary parties and determines the legislative agenda. The Government of Russia exercises executive power in the Russian Federation. The members of the government are the Prime Minister, the deputy prime ministers, and the federal ministers. It has its legal basis in the Constitution of the Russian Federation and the federal constitutional law "On the Government the Russian Federation". Approximately 98 people have been head of the Russian government since its establishment in 1726. The chairman of government was a member of the Supreme Privy Council, which was created on 8 (19) February 1726 by Empress Catherine, and from 8 (20) September 1802 ministerial duties were allocated by the Committee of Ministers, which was established on in accordance with the proclamation of Emperor Alexander II. Beginning with Count Aleksandr Romanovich Vorontsov, the eldest of the officers was de facto chairman of the committee. Eight years after the inauguration of the manifest, the first de jure office holder was Count Nikolay Rumyantsev. The Council of Ministers was unofficially formed in October 1857, as a result of Emperor Alexander II's reforms; its first session began on 19 (31) December 1857. Before the actual formation of that body on 12 (24) November 1861, the Emperor himself was in charge. The Council of Ministers consisted of chairmen of the State Council and the Committee of Ministers, as well as high-ranking officers appointed by the Emperor. The first session ended on 11 (23) December 1882, after the number of files to the Council greatly decreased. The Head of the Republic of Bashkortostan is the highest executive position in the Republic of Bashkortostan, a federal subject of the Russian Federation. The Supreme Soviet of the Russian SFSR, later Supreme Soviet of the Russian Federation was the supreme government institution of the Russian SFSR in 1938–1990; in 1990–1993 it was a permanent parliament, elected by the Congress of People's Deputies of the Russian Federation). The Chairman of the Federation Council of the Federal Assembly of the Russian Federation, also called Speaker (спикер), is the presiding officer of the Upper house of the Russian parliament. It is the third highest position, after the President and the Prime Minister, in the government of Russia. In the case of incapacity of the President and Prime Minister, the chairman of the Federation Council becomes Acting President of Russia.